I ran out of Christmas cards. The grand plan to make cards didn't get completely off the ground. The pieces are still there and I'll take tentative steps to work on the cards over the next year. Maybe, by October of next year, I'll have cards for 2011 nearly finished. So, after work, I had to dash some place and get another box. Well, I got Target gift cards from my daughter and son-in-law for my birthday as well as from a couple of co-workers for Christmas. I put the last roll of toilet paper on the spool on Monday morning so I best replenish that. Off to Target I went. At first, I couldn't find the cards. They were tucked off by themselves. They still had a great selection. Best of all were the 18 cards for $5.00. I didn't hold out hope there would be something with a cat on the front but, to my surprise, the gal who asked if I needed any help found this box. In fact, they had 2 others. There were a lot of cards with a dog on them. The cat cards were down to 3 boxes. I only needed one but if I have come spare cash, I am thinking I should go back and purchase the boxes left. 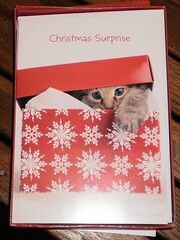 It's a great price for cards and I just have to send a card with a cat on it. I remarked to the gal on the disparity of cats versus dogs cards and she said, "Well, cats and Christmas antics just seem to go together. On the way home, it occurred to me, they do. Take this video from the web site, Simon's cat. While my gals weren't interested in the tree beyond something to sit under, Carole's cat, Faux adored the tree as something to be climbed and played in. I came home once to find the tree on the floor and Betsy and Rascal looking innocent while Faux was nowhere to be found until Carole got home that night. What would a dog do? A dog would drink the water out of a real tree stand and pee on the tree, marking his territory. And we think about the terminology of the season. You can do so much with "Meow-y Christmas", or "Merry Cat-mas". "Dog"? "Hound"? "Canine"? Nothing there to make even a bad pun of. So, I need to get stamps and then, all my cards will be sent by the weekend. This is a huge victory over last year when I didn't send many cards because I didn't have the money for stamps. "Meow-y Cat-mas" and may your stocking be filled with tuna and toys.